The Contest starts on Monday, 22nd February, 2016 and closes on 31st March, 2016. 1. Participation in the Contest is purely voluntary and participants are not required to pay any money for the participation in this Contest. 2. By visiting the Contest pages, entry and participation in this Contest on Facebook and Twitter, you are deemed to unconditionally accept these terms and Conditions along with Terms and conditions of facebook, twitter, creditnation & bookmyshow. 3. CreditNation.in is not liable for comments, pictures or tweets made by any participant. All the views and suggestions belong to such participant and any comments submitted, published, shall be deemed to be personal views of the Participant and CreditNation takes no responsibility and disclaims all liability in relation with the same. 4. The content made available on the Contest webpage is exclusively for personal use; no commercial usage of the content is permitted. • Like CreditNation on Facebook : https://web.facebook.com/creditnation.in/ Submit a post, gif or video of his/her Saanp Moment, which is basically a moment when he/she was stuck in a problem. Saanp moment can be any big or small problem, which made her/him felt upset. The entrant must Like Creditnation’s page on Facebook in order to enter. 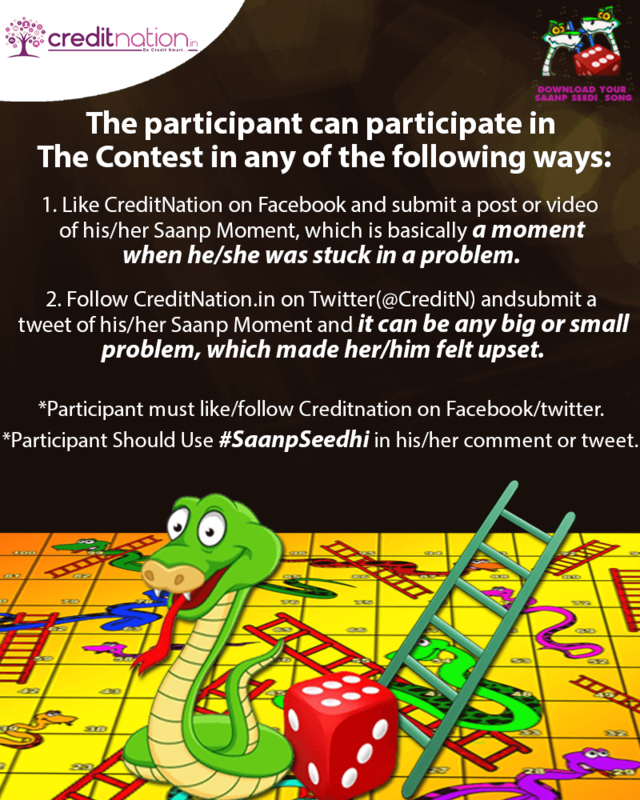 Submit a tweet of his/her Saanp Moment, which is basically a moment when he/she was stuck in a problem. Saanp moment can be any big or small problem, which made her/him felt upset. The entrant must be following @CreditN on Twitter in order to enter. Participate by Commenting / Replying / Posting + Tagging on the Contest announcement post on Facebook and Twitter. 6. Participant shall not submit or distribute any objectionable tweet / comment / photo. 7. Facebook and Twitter are neither a sponsor nor affiliate of this contest. 8. CreditNation reserves the right to exclude any particular participant from the Contest at its sole discretion without providing any reasons thereof. Best entries get the chance to win a bookmyshow gift voucher, worth Rs.500. 10. One Winner will be chosen every week and will receive a gift voucher of worth Rs.500 of bookmyshow. CreditNation will announce the winner every Monday on facebook at 1 pm. 11. No cash alternative to the prizes will be offered. The prizes are not transferable. Prizes are subject to availability and we reserve the right to substitute any prize with another of equivalent value, if prize is not available. 12. CreditNation Reserves the right to change or amend above listed prize at anytime during the validity of this Contest. 13. The prize (Voucher) will reach the winner within 10 days, from the date of announcements. Winners will need to share their details (mobile number and email id) via Direct Messaging on Twitter/ Facebook. 14. Participants will have to submit genuine and appealing tweets / comments / photos and best entries will be chosen at the discretion of CreditNation.